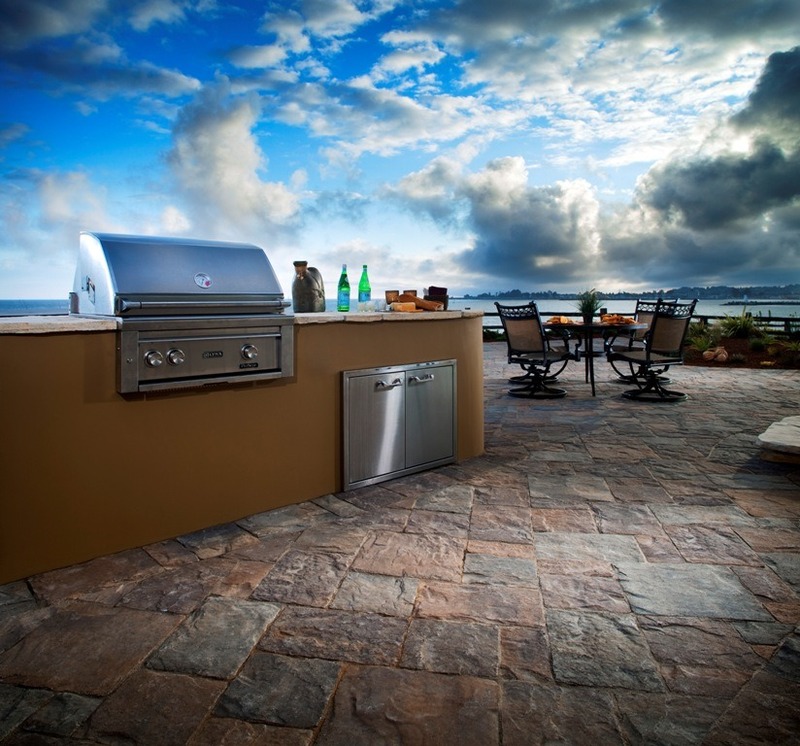 Do you want a barbecue island that is the envy of your neighbors? The sky is almost the limit when it comes to countertop options. Note that every surface requires some level of care so you’ll need to weigh pros and cons based on your location and lifestyle. To give you an idea, slate tile needs sealing and so does granite. Are kids going to bang up stainless steel? If so, maybe consider an easy-care engineered stone. These days, countertops can look so cool that people may notice them before anything else. 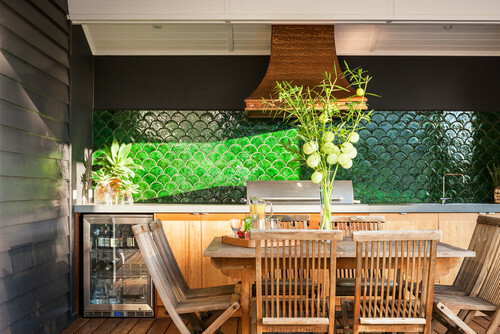 Placing an outdoor barbecue against a wall presents an opportunity to get creative with tile choices. While many people opt for stucco, keep in mind that it can become stained by smoke especially if a light color. Tile, while more expensive initially to install, can easily be wiped down after your cedar chips smoke that unbelievable salmon. 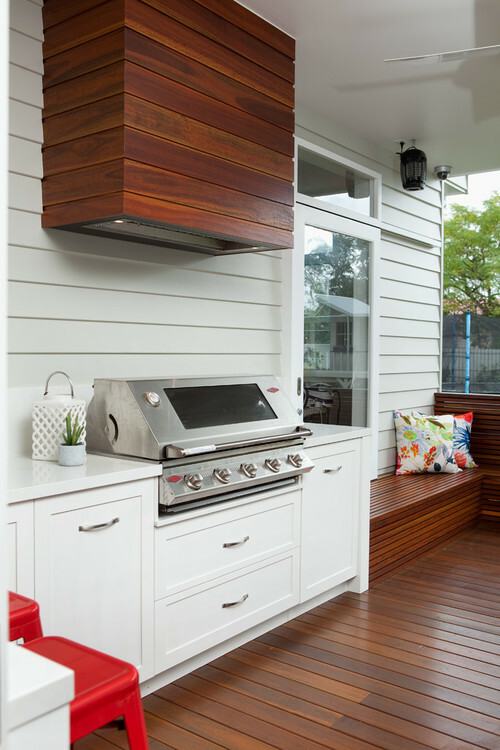 Hoods are necessary for ventilation in areas where smoke can’t clear on its own but they can certainly accessorize a space. 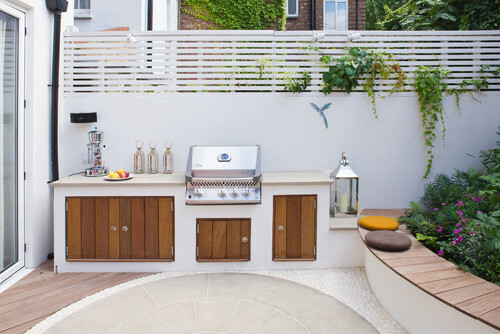 The barbecue island in the photo above would not look nearly as impressive without the custom wood-paneled hood that happens to match the decking. There is a lot to say about this barbecue island. 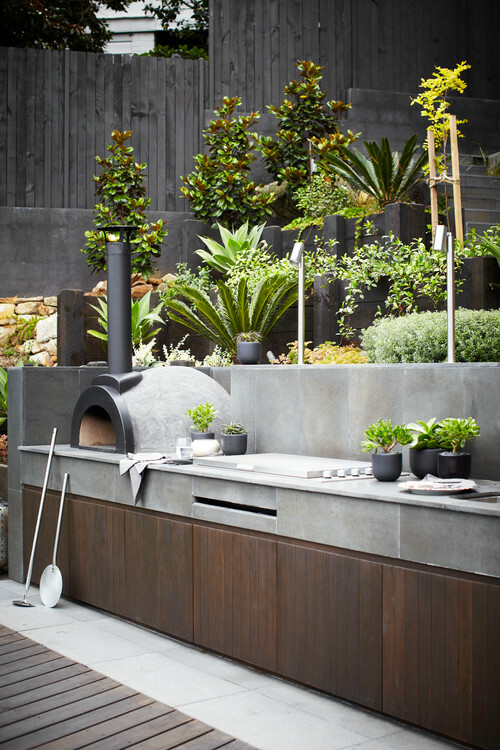 Sure, there’s an enviable pizza oven, modern downlights as well as a really zen countertop and backsplash. 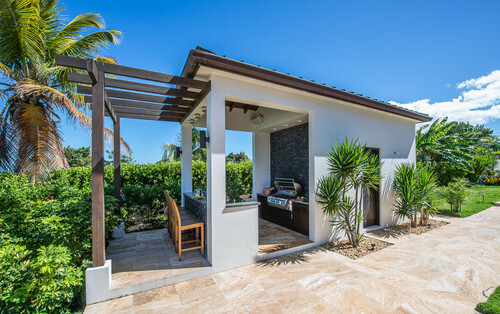 However, these homeowners did an amazing job of blending their outdoor kitchen exactly into its surroundings by using similar colors and materials. The little potted plants even help tie the existing landscaping and dark fencing together, too. Have a spacious backyard? Never run out of storage by giving the barbecue its own structure. Guests will love congregating in a separate outdoor oasis, for sure. The building could be a changing area for the pool, an outdoor bathroom, a place to keep surfboards or bicycles or… you name it. 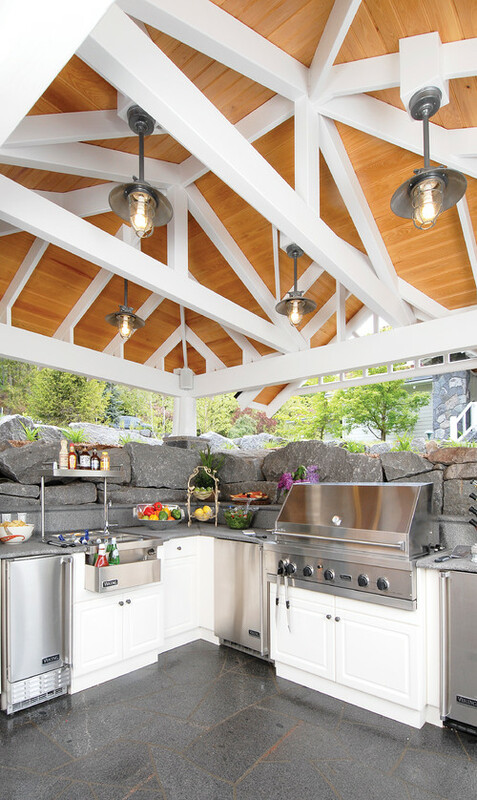 Speaking of storage, the open shelving in this barbecue island contributes to its airy feeling and provides visual interest by giving the homeowner the opportunity to easily display things for guests to grab and go. We also love the raised bar area, perfect for readying glassware for cocktails. 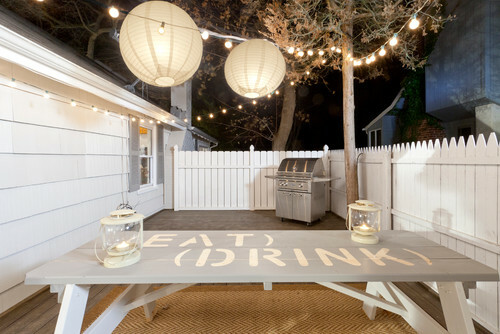 Is your barbecue under a shade structure like this on your outdoor patio? A skylight lets in light by day or night while breaking up the monotony of a ceiling. Plus, it looks fantastic. 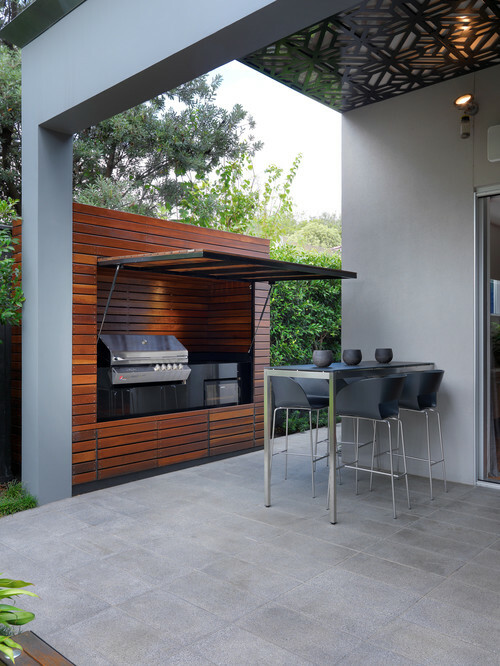 Outdoor barbecues are quite attractive these days but should you want to cover it completely—which might be a good idea depending on climate and proximity to the ocean—give it a gorgeous garage-style swing door. Open it when in use and close it in between. 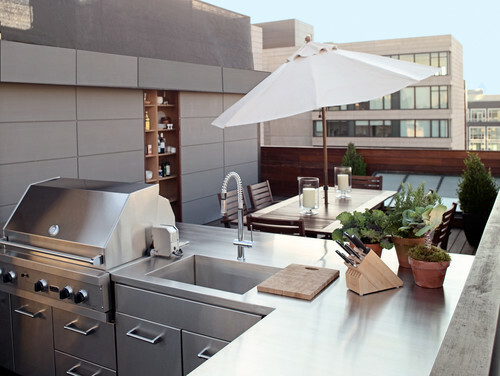 Guests will love the surprise element, however, it’s important to make sure that the area is well ventilated. 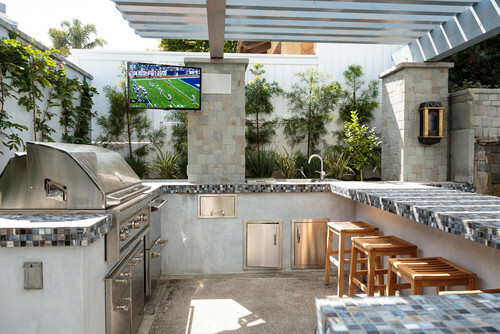 Never miss another minute of football with a weatherproof LED TV on your barbecue island. Technology has improved so that these televisions can handle glare from the direct sun, wind and rain, no problem. Manufacturers even sell different models depending on what kind of sunlight the area receives. 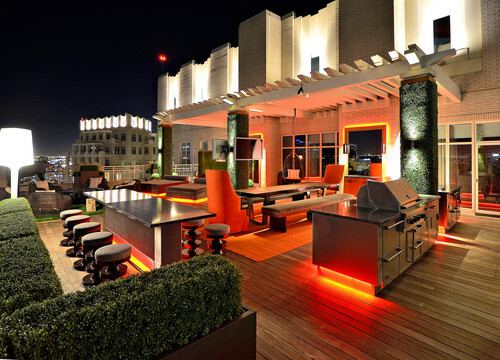 Strip or rope lighting placed near ground level not only serves a practical purpose by brightening otherwise dark areas, but it’s also decorative, as you can see above. The orange lighting is certainly modern and energizing. Blue lights tend to lean a bit more calm. But, with the press of a remote, you can actually change the color of this particular style of LED light based on mood or occasion. How cool is that? Easy globe string lights can be yours with a quick stop into a local retailer like Home Depot or even Costco. They are a cost-effective way to liven up a space with the added bonus of being all-weather if you’d like to leave them up year-round and removal is simple for the times you’d like to pack them away. 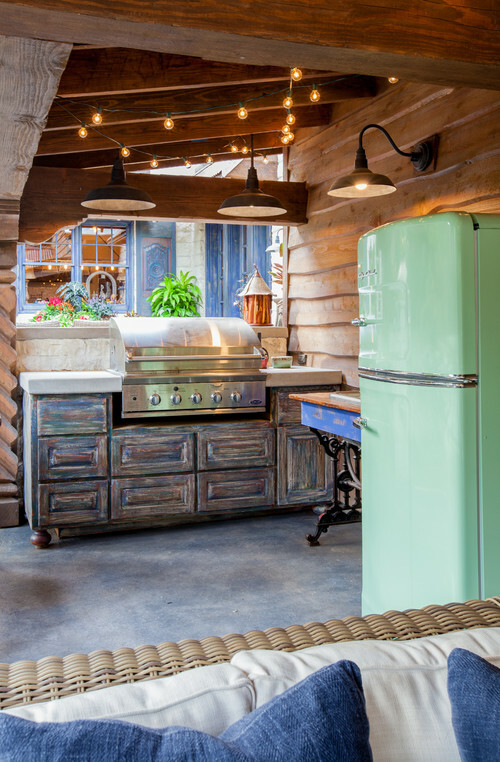 The vintage, colorful look of retro refrigerators fits into rustic as well as contemporary backyard designs. Smeg fridges are new but convey the same vibe if it’s too hard to locate a true 1950s version. 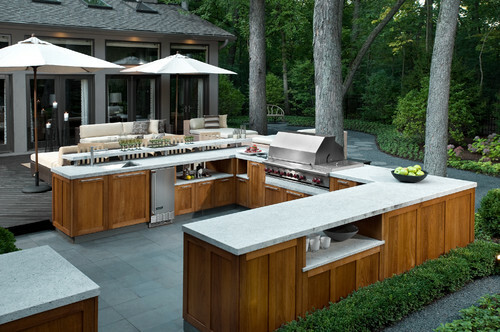 We love how this barbecue island is tucked into an enclave partially walled by natural rock that may surround a pool, container garden or some other part of the outdoor kitchen. 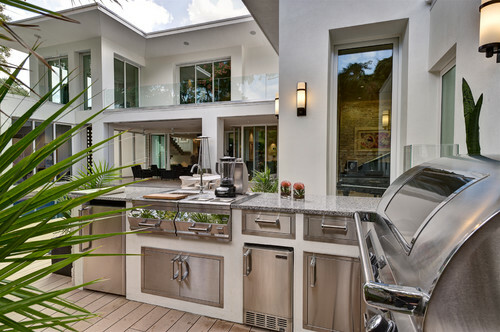 The rock makes this otherwise pretty typical design much more interesting and unique, plus it likely keeps the kitchen out of view from the home which lends an element of surprise. There is no need to make a margarita indoors. Keep a blender outside in the barbecue island. Or, better yet, have one built in to the countertop! This applies to stick blenders, mini food processors or whatever else might make it easier to prepare a meal all in one place. Do not forget to accessorize an outdoor barbecue area with pieces like these little lanterns, pillows, vases, patter and other art to make the space even more inviting than it otherwise would be. 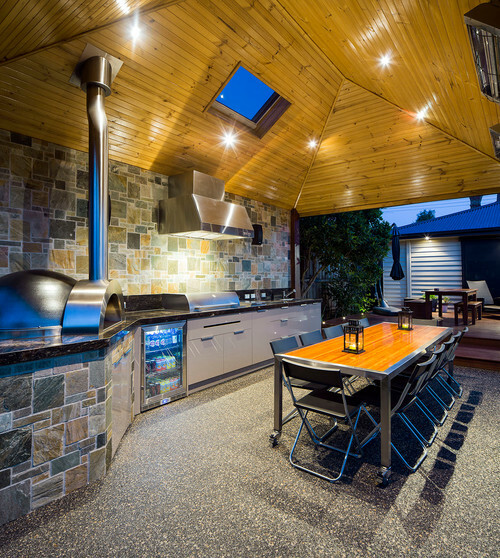 How do you make your outdoor barbecue area awesome?